I just saw the news. Rick Warren’s youngest son committed suicide at the young age of 27. It made me incredibly sad. Regardless of your opinion about his beliefs. The fact is – he has touched countless people through his church ministries, and his many books, including A Purpose Driven Life. I have never been to his church. In fact, I have never read his book. So, you may ask, why did this touch me? The loss of a loved one is devastating and life changing – I can’t imagine how much more devastating to lose a child than to lose a parent or grandparent. But even more than that – I think often people think that people of faith don’t struggle, don’t face pain — that life doesn’t kick them in the face just as hard as anyone else. Pastor Warren’s son’s challenges with mental illness has apparently been something that the family has been battling for 27 years. And now, his son is gone. 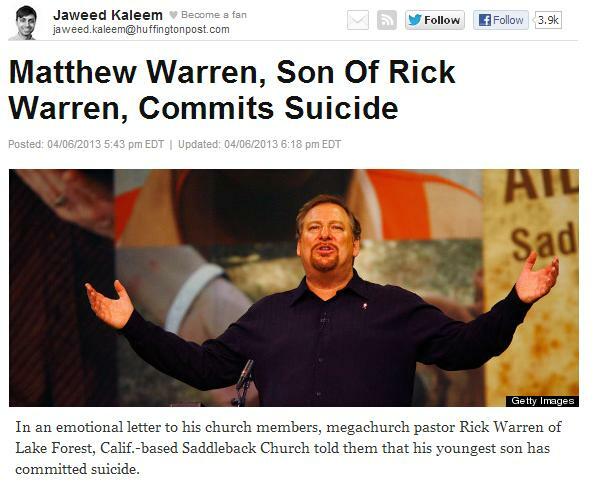 I can’t imagine what Rick Warren and his family are going through right now. So I am sending them prayers. Prayers to their family, and all that love them and the son they just lost. May God give them strength to walk through their grief. « If you need nourishment for the journey, get it.